Robert Hogg wrote that Hawkridge “is a very popular apple in East Sussex especially around Hailsham, Heathfield and those parts where it is met with in almost every orchard and garden” (Hogg 1851). The origin is Hawkridge Farm, Hellingly, near Hailsham. It is currently cultivated as part of Brighton Permaculture Trust’s National Collection in Stanmer Park, Brighton. You can see a Hawkridge apple tree (planted 2009) in Home Farm Orchard, Stanmer Park ( map). 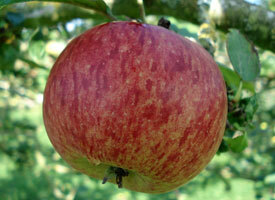 Hawkridge is a medium sized apple. The shape is intermediate to flat, retangular to convex, prominent ribs on body and at eye. The skin is golden yellow with pale red stripes, flushed a dark bright crimson with darker stripes. The flavour is sweet and sometimes described as balsamic. An early September apple, it can be stored until October.